Cross Necklace is inspired by faith, hope and love. Our Cross Collection is available in Sterling Silver, and includes the classic necklace or charm, and also the new stud earrings and ring. 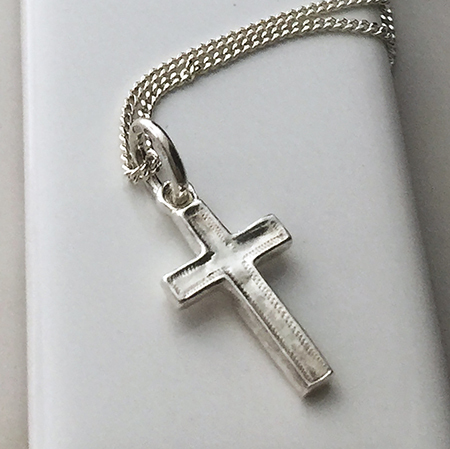 Cross Necklace is heavy and organic in feel with a detailed engraved edge. A classic piece. Perfect for goddaughters, family and friends. The Cross Necklace makes for the ideal gift for a Christening. Christenings are a significant life stage for both the child and parents life. It has long been tradition to bring items to commemorate this special day. To mark the event, the Cross Necklace is the perfect keepsake gift. After all what’s more authentic as a Christening gift than a cross? All about keeping the faith and tradition. ‘My dear friend and now god mother to my daughter gave me this beautiful sterling silver Cross Necklace as her Christening present. Not only is the perfect gift for my little one to wear and cherish forever and be reminded of her godmother, but the fact that it is handmade in London makes it that extra bit special given that this is where the Christening took place. While I wear the necklace for now, I will be passing it down to my daughter for when she is old enough to wear it herself. A christening gift that has now become a family piece of jewellery that will be passed down the generations and have a special place close to our hearts’. Cross Necklace by Bianca Jones Jewellery, all about keeping the faith.